I hoped by today I would at least be finished with the heels of these socks. After “tinking” lots of stitches I think the stripes are pretty much matching. I have knit socks with turned heels before, but it was years ago. I forgot everything and didn’t understand what I was doing. So instead of knitting one row on one sock and then the other I thought it would be best just to work one heel completely. 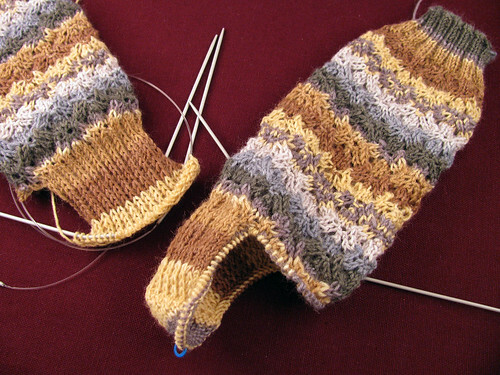 Big mistake, since I am having trouble counting heel flap rows in the slip stitch pattern. Have I knit enough and can now turn the heel or do I need two more rows? The idea of un-knitting yet again is holding me back. Next time I knit both heel flaps together. This counting after the fact is just too uncertain. This entry was posted on Thursday, April 23rd, 2009 at 3:00 am and is filed under Knitting. Tagged: Knitting. You can feed this entry. You can leave a response, or trackback from your own site. It won’t matter if you’re off a row of 2. The socks are knitting up lovely!